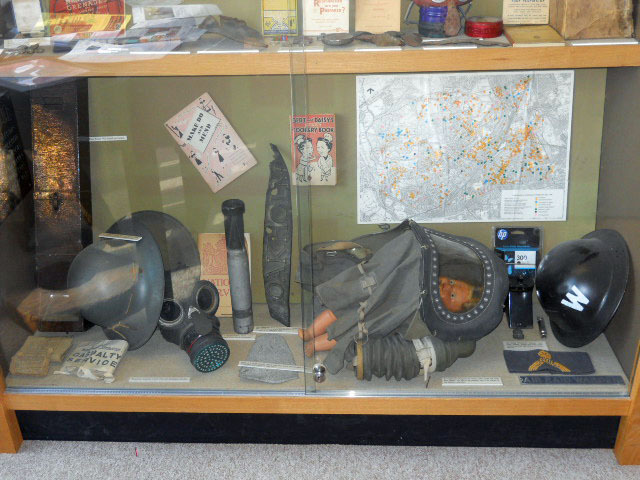 Gas mask used in WW II. The Wimbledon Society was founded in 1903 with the aims of preserving the town's heritage and protecting local interests. The group is run by volunteers, who help to conserve the environment and maintain public services such as parks, libraries, and the Wimbledon Society Museum. Located on the Ridgeway, the museum is on the first floor of the Village Hall, and tells the history of the Wimbledon through the noteworthy collection of Richard Evans, which he donated in 1916. The museum also houses artefacts from excavations, models, and takes you on a pictorial journey of many key residents in the area. Although the museum is free, I have never bothered to visit before, mainly because the opening hours are only 2.30pm - 5.00pm at weekends, and it hasn't always been convenient. Last Saturday, however, I decided to make the effort. I was a bit surprised when I first got there. It was not as welcoming as I expected: two smokers were blocking the entrance, and when I squeezed passed and stepped through the door, I was hit with a strong smell of beer. Photograph of Wimbledon Theatre in the 1900s. This is because the ground floor is a gathering place for the Working Men's Club; it has a snooker room, billboard of upcoming events, and although I did not see a bar, I'm pretty sure there was one in a room down the hall. The museum has a number of books for sale. Fortunately once I had got upstairs, the smell of booze dissipated and I was greeted by an elderly volunteer sitting at a table, who was selling history books. These included small booklets like Early and Medieval Wimbledon for £2, and more comprehensive works such as Historic Wimbledon for £11.99. The museum is made up of one large room, and a gallery, which is opened once a month. The exhibition starts with a geographical history of Wimbledon, describing what the landscape used to be like thousands of years ago, and displaying a number of fossils such as a nautilus, which is a type of mollusk that still exists today, but is in grave danger of becoming extinct due to overfishing. Despite this, they are not a protected species. Red squirrels used to be prevalent in Wimbledon. The range of local wildlife in Wimbledon has decreased since the nineteenth century, which was made evident by the collection of taxidermic animals, including a red squirrel and and polecat. Bird Eggs found on Wimbledon Common in the 1930s. On the bird front, we still have a wide variety that can be found on Wimbledon Common, and it was interesting to look at all the different types of bird eggs that have been found there. They came in all colours and sizes, including a speckled kestrel egg and a linnets egg, which was no bigger than your smallest fingernail. Bullets found on the Common. The Common was used by the military and airforce during the nineteenth and early twentieth century. In 1859, the National Rifle Association was formed because of fears of invasion from France. Their first meeting was opened by Queen Victoria, who fired the shot on Wimbledon Common in 1860. The next display went way back in time to the Stone Age. It gave a more general history about Neanderthals, and showed off the types of tools they used to make. The museum then went on to talk about the Saxons, whose original named for Wimbledon was Wunnemannedunn. According to records, in the year 568, two Saxon leaders fought against King Ethelbert in Wimbledon, forcing him to flea to Kent. Later when the Romans invaded Britain, they built many roads, including The Ridgeway (where the museum is), which is the oldest road in Wimbledon. Remains of St. Mary's Parish Church. One of Wimbledon's most important figures in history is Lord Nelson. He and his friends, Sir William and Lady Hamilton bought a house together in Merton in 1801. The seventy acres estate was part of Wimbledon Parish, but after he and Sir William died, Lady Hamilton was forced to sell the property. Kings College Uniform from the 1930s. The Church of England set up many schools in Wimbledon, and by 1900 there were four thousand places for boys and girls. Schools included Cotteham Park for infants (1867), Haydon's Lane (1868), Holy Trinity (1874), and Dundonald Road (1890). Roman Catholic schools were also set up, many of which still exist today, including Wimbledon College for boys, which was founded by Reverend Brackenbury after his previous school was bought by Jesuits in 1892. That same year, a group of nuns set up the Ursuline Convent for girls, and the two became a joint comprehensive high school. This is where I went for my A-Level years, and although no longer run by nuns, it is still firmly routed in Catholicism. This horse drawn bus was in use from 1860-1910. Until a steam railway was built in 1838, travel around Wimbledon was conducted by road. The museum displayed several miniature models, showing how different vehicles progressed. Starting with a horse and cart, things steadily evolved to motor-powered busses. Tennis and Wimbledon are like Wallace & Gromit: you can't have one without the other. Of course, any museum about Wimbledon would not be complete without talking about tennis. Wimbledon is synonymous with tennis, but originally, the tennis lawn was actually a croquet club founded in 1868; the first tennis Championship was held in 1877. My tour of the museum ended with a display of various items from World Wars One and Two. In the First World War, Wimbledon was only bombed once, but between 1939-1945, three hundred and fifty bombs fell on the town, destroying 810 homes and killing 150 people. My grandmother lived in Wimbledon during the war, and her father was killed in a bombing after giving up his seat on the bus and cycling home instead. Wimbledon Society Museum gives a detailed history of the town, explaining how it went from an insignificant village to a prominent borough in 1905. It is well worth a visit if you are interested in local history.